My hair is naturally dry and prone to breakage, so moisturising hair masks are always essential for me! Once a week (or, realistically, as often as I can remember!) I like to use some kind of deep conditioning treatment to give my hair a boost and minimise damage. Sometimes I'll just use pure coconut or avocado oil all over my hair as an overnight mask, but lately I've been loving a quicker approach using the Lulu & Boo Shea Butter & Jojoba Deep Hair Treatment* (£11.50). This hair treatment utilises Shea Butter, Coconut, Castor, Olive and Jojoba oils for a highly moisturising and conditioning effect. It's also scented with Geranium, Lavender and Cedarwood essential oils which are said to heal and soothe. To use this hair mask, you simply warm a small amount in your hands, apply to dry hair and wrap in a warm towel (or take the easy route like I do and just put your hair up in a bun)! You can leave it on overnight, but I prefer a quick 15-20 minute treatment before washing. A little of this product really does go a long way, so don't make the mistake of using too much or you'll have to shampoo a few times to properly wash it out! Each time I use this mask my hair is a lot more manageable, and although it doesn't completely banish the frizz, my hair is always noticeably softer, smoother and less tangled. I'm a sucker for products that look good sat in my beauty stash and I love the simplicity of the frosted glass jar with the metal lid. I'm also super impressed that it's made with 98% organic ingredients! Lulu & Boo's products are all made with a high percentage of natural and organic ingredients, and most of their range is certified organic by the Soil Association too. You can find out more about Lulu & Boo and check out the rest of their product range at luluandboo.com. 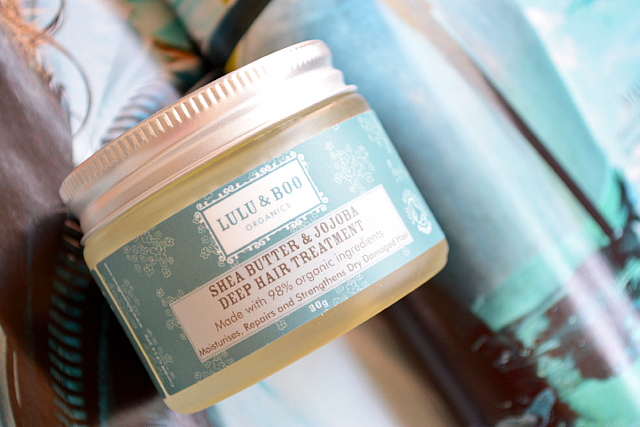 Have you tried any products from Lulu & Boo before? It sounds wonderful, thanks for sharing, xoxo. Do you know if the ship to the US? no i never try before, but i would try now! Nice post! i ALSO love Lulu and Boo hair mask, real often I put a little quantity on my braid and smell the geranium all day long!!! This sounds like something I could do with. I really should be a bit kinder to my hair but I'm such a cheapskate that I always find good nourishing treatments to be too expensive for my measly budget!